Adding a new tile backsplash is more than just a way to turn up your kitchen’s style. Anyone who cooks frequently knows that an easy-to-clean backsplash makes good sense. And the good news is that the beauty and utility of a new backsplash can be yours in a matter of days. With thousands of beautiful tiles to choose from, deciding on your new kitchen backsplash is probably going to be your biggest task. It should also be your most exciting one: this is your chance to show your creativity and style! The kitchen’s tile backsplash is often the one place you can show a bit of whimsy: a burst of color or the flourish of a mosaic. Even if you’re only looking for a low-maintenance tile that neatly ties the room together, you still have so choices to choose from. You can experiment with different materials and textures: glossy glass, cool natural stone, or sleek stainless steel, to name a few. Or you can choose one neutral color but play with different sizes and shapes. Whether you’re going for a quiet, classic beauty or a bold statement, your backsplash tiles should make you happy every time you walk into the room. Your backsplash can be the crowning jewel of your kitchen, and with the multitude of gorgeous options available, choosing the perfect tile for you can be at once both exhilarating and confusing. First you should decide if the new backsplash will be the common thread that ties the room together, or a daring contrast that leaps out from an otherwise uniform décor. Things you need to consider when you are thinking about your decision for a new backsplash are your cabinet and countertop color/type, appliance colors, flooring color/type. Once you have that information together, then you can decide if you want to go with backsplash tile that compliments these colors and will contrast them creating either a dramatic or fun flair in your kitchen. Whatever you decide, be true to your style, remember the kitchen is your place to express yourself creatively, and it should accurately reflect you and the rhythm of your home. Next you’ll want to think about the tile type. If you are in the market for neutral tones, then natural stone is great for achieving a traditional, rustic, or even a modern look, and it has become a popular choice with the eco-friendly crowd. 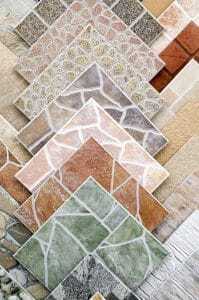 It has the added benefit of resistance to wear and tear; you can’t break natural stone. For those who follow Feng Shui, you successfully implemented nature into your home. Glass tiles have been around for a while and is more popular than ever. It is gorgeous and gleaming, it adds a sophisticated blend of color to the kitchen decor, especially in the rainbow-like iridescent. In the clear with light color undertones the glass tiles give a clean elegant look to your kitchen.